to collect ecological breeding data (e.g. other species roosting or breeding in weaver nests, nesting associations with other species, nest predation). This report summarises results for the first 2.5 years of the project. The annual increase in records has been dramatic. In the six months of 2010 that the project was active, 438 records were accepted, then 1348 records in 2011 and 3418 in 2012. The species with the most records were Southern Masked Weaver (n=1510), Cape Weaver and Village Weaver. 62 of 117 species had photographic PHOWN records by the end of 2012, and an additional three species have records without photos. 206 participants have contributed photo records to PHOWN to the end of 2012, with most records being submitted by Pieter Cronje (n=1540). The natural range of weavers covers about 60 countries, in sub-Saharan Africa, southern Asia and the Indian Ocean islands. 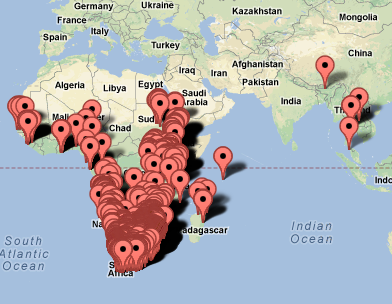 There were PHOWN records from 28 countries by the end of 2012, with most records from South Africa (n=4611) and Namibia. In 2012 funding was received for WRAP (Weaver Research Africa Project), largely to promote PHOWN. Local talks and workshops on PHOWN were presented in South Africa. Internationally, talks were presented at the Namibian Bird Club 50th anniversary, and workshops were held in Kenya. At the 13th Pan-African Ornithological Congress in Arusha, a round table discussion, a plenary and a weaver symposium were presented. A successful one-day conference on weavers was held on 26 January 2013. Details of these events are shown in an appendix.